As a costume designer for many years Jeanette takes inspiration from historical details and styles, incorporating and transforming them into her contemporary work. This week is dedicated to fashion or wearable felt, and we will focus on collars, cuffs, and mantles inspired by the fashion of the Victorian period. Using basic pattern cutting techniques participants will design a variety of individual collars, incorporating a knitted, web-like material into the felt. Jeanette has spent time on the Shetland Isles in the far north of Scotland where she learnt to make up these fine lacey structures, which have since played a prominent role in her work. You will make a mantle, a collar, and a set of cuffs. However, if you want to explore further shapes and forms please do bring some extra material with you. *Items with an asterisk are available for purchase at the Shakerag store. 3 metres of merino “prefelt” (medium weight, 100 – 120cm wide) in a colour of your choice. Time permitting you will complement your outfit with an accessory such as an evening bag. I will provide images/research material on a disc and also some small samples of my work (limited to what I can bring). As a trained costume designer (MDes in Theatre Costume), Jeanette has been constructing garments for the stage for many years. 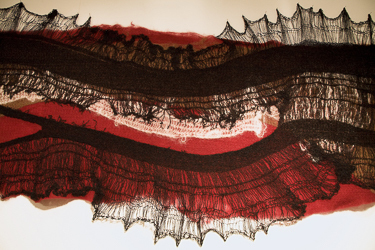 Over the past decade her interest in costume design has moved on to performance art, and many of her recent projects have featured large-scale installations rendered in knit/felt or paper. Born in East Berlin, after her training as a tailor for women’s clothing Jeanette worked in the costume departments of various theatres, including the Comic Opera in Berlin, Scottish Opera, English National Opera and Opera Australia in Sydney. Her considerable commitment to the worlds of fibre and performance art is evident in the number of groups she has been involved in founding. In the same year that she completed her Masters in Design at Edinburgh College of Art, she co-founded Metacorpus, a company that aims to increase the awareness and appreciation of costume art through performance art productions. Recently Jeanette has undertaken various textile residencies, working with communities in remote locations such as Caithness and Shetland. Her latest residency took her to the Newburgh town of Fife, which she has now decided to make her permanent base. She continues to make theatrical hats and teach textile art, and is in the process of establishing a ground-breaking centre for Textile Excellence.